The Magnetic Fields' recent return to Merge has already born fruit in the form of some classic reissues and a rarities comp. Now, the Stephin Merritt-led group have announced their first new studio album since returning to their former label. Entitled Love at the Bottom of the Sea, it's due out March 6. Not only are the Magnetic Fields back with their old label, they've also rediscovered their former synth-tinged style. An announcement from Merge notes, "After putting out three synthesizer-free albums, the Magnetic Fields are returning to the signature mix of synth and acoustic sounds they established in the '90s with Merge releases such as The Charm of the Highway Strip and Get Lost." None of the 15 songs is more than three minutes long, and they feature Merritt backed by his usual cast of contributors. The songwriter said in a statement, "Most of the synthesizers on the record didn't exist when we were last using synthesizers," so don't be too surprised if this one sounds a bit on the modern side. 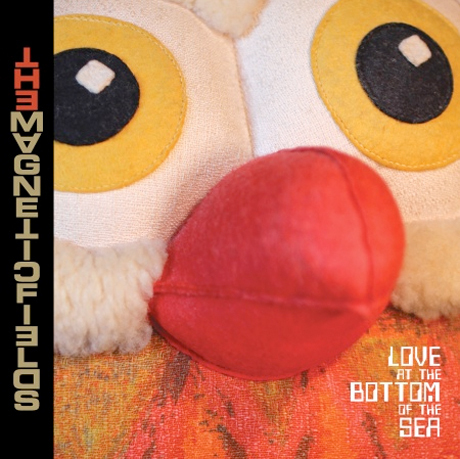 If you can pre-order Love at the Bottom of the Sea from Merge soon, you can get it on limited-edition eggshell-coloured vinyl. The first 100 people who order will also receive a free signed poster and a button. You can order a copy here. As if this weren't exciting enough, the band will be heading out on tour this spring. The extensive outing includes dates in Toronto and Montreal, so scroll past the tracklist to see the schedule. 5. "I'd Go Anywhere with Hugh"
6. "Infatuation (With Your Gyration)"